With London House, Gordon Ramsay ventured out of his usual central London locations to set up in Battersea. London House is a neighbourhood bar and restaurant and resonates with suburban chic. The restaurant overlooks the lovely Battersea Square and boasts of a décor that is modern and classy, yet intimate and welcoming. The menu offers a comprehensive range of modern British dishes, but also boasts of a cocktail lounge bar and a beautiful garden for al fresco drinking (and dining) for those who simply want a tipple. 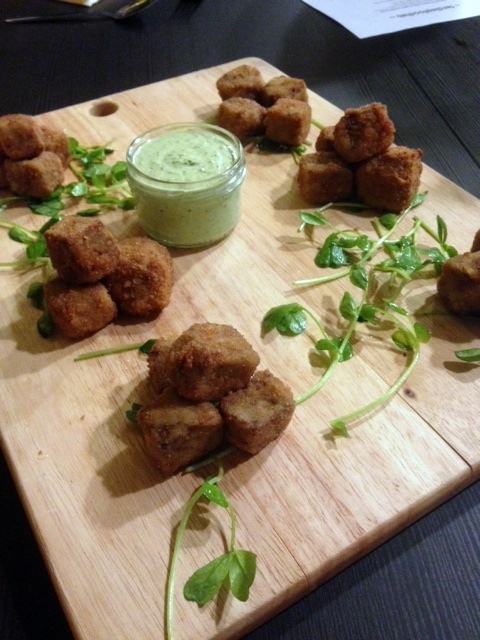 I recently visited London House as part of a bloggers dinner, and the evening began with some tasty canapés of ham hock and Keen’s cheddar croquettes with mustard mayo and veal Scotch eggs with homemade piccalilli. Both were abundant with flavour, well seasoned and perfectly crisped. 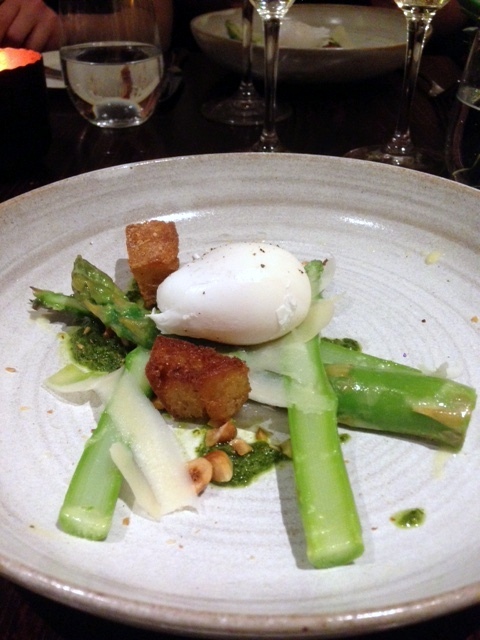 Dinner consisted of three courses including some delectable sourdough bread to nibble on before our starter of Wye Valley asparagus with kale pesto, poached duck egg, wild garlic and hazelnuts. This was an accomplished dish, with each element being extremely well executed. The asparagus maintained a nice crunchiness and the kale pesto was alive with freshness. The poached egg was soft and runny, but had not been seasoned. The wild garlic and the hazelnuts were also lovely and added a nice dimension to the dish. Simon Fernandez, the man behind ferdiesfoodlab, burst onto the supper club scene some seven years ago, with his then legendary fernandezandleluu supper club. His latest pop up being a project sees him in collaboration with the London Kitchen Project in Battersea. A non-profit community centre that started life about six months ago, the London Kitchen Project seats 40 and devotes itself to food, sustainability and the use of 100% renewable energy. The collaborative project sees ferdiesfoodlab running a series of pop up dinners at the London Kitchen Project approximately every four weeks, serving a six course-tasting menu priced at £45. P and I popped along recently and found the dinner to be well considered and cleverly constructed. The first course was a 5hr slow roast rib of lamb, pulled, pressed, cubed and coated in breadcrumbs, served with garlic Turkish bread and a dip of fresh herbs and lime. The lamb was delicious, moist and moreish, and went swimmingly with the accompanying bread and dip. But the crumbing on the lamb could have been crispier which would have really elevated the dish. Soif is owned by the same group who own Terroirs. 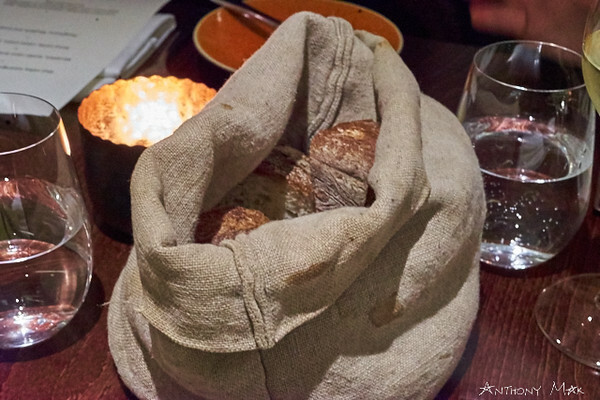 When I visited Terroirs in 2009 shortly after it opened, I thought it to be one of the most exciting wine bar and restaurants to grace the London stage. Well priced, heartfelt, rustic French cooking in an atmospheric central London location – what could be better? The offerings of ‘natural’ wines at decent prices worked a charm too. The wine bar and restaurant was obviously so successful that it spawned a second, Brawn in East London, and then the third, Soif in South London. Like Terroirs, Soif offers a reasonable range of tasting portions for sharing and main sized meals, as well as a selection of ‘natural’ wines. 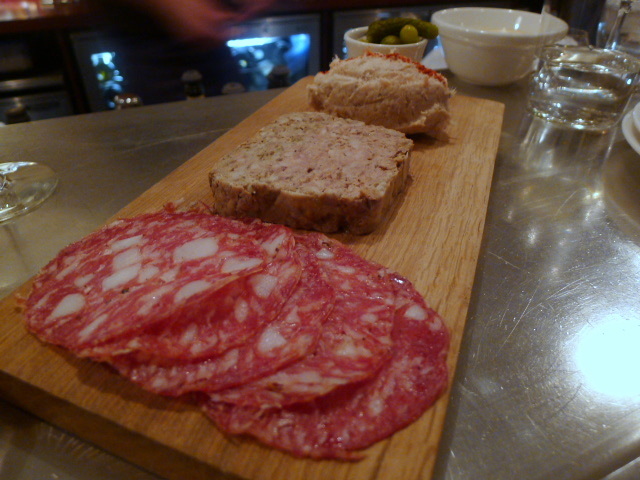 We started with the charcuterie platter (£12.50) of pork terrine, rillette and Toscana salami. I loved, loved, loved the rillette at Terroirs and so this was the part of the platter that I was looking forward to the most. Instead I found the version at Soif to be overly fatty and not particularly enjoyable with a disproportionately high ratio of fat to meat. The terrine on the other hand was meaty and flavoursome. The salami was also good. It has to be said that eating in a restaurant with no other guests feels rather odd – it makes for a deathly quiet experience. That is what happened to me when I visited The Fish Place as a guest of the restaurant recently. It opened in the middle of November, and is situated in a rather obscure spot, right near the heliport in Battersea overlooking the Thames. It’s pretty tricky to find, and the best way seems to be to look for the Hotel Verta and head to the left of it (you’ll get what I mean if you ever decide to go and look for the restaurant). I imagine not being on some major thoroughfare, its newness, and the fact that it was bitterly cold when I went were the reasons behind the zilch guest list. But let’s talk about the food. As you probably guessed, this is a seafood restaurant. 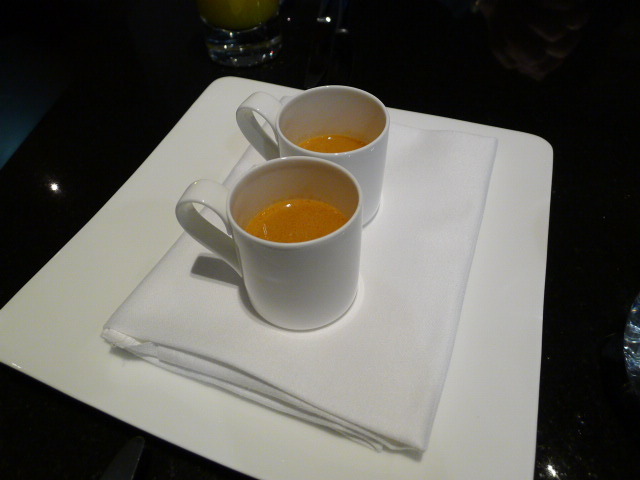 For the first amuse bouche, we had the fish veloute with pernod and parsley cream which is also listed as a starter on the menu. Thick and creamy, this was really lovely and nicely reduced to produce a good strong flavour of seafood.